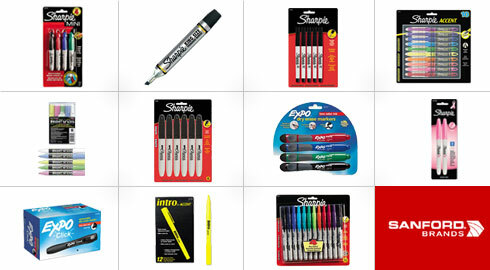 With more than a dozen brands you know and trust, Sanford is the leader in the writing instrument and art supply industry. As a subsidiary of Newell Rubbermaid since 1992, Sanford produces the many brands that you’ve come to see every day: Sharpie, Colorific, uni-ball, Paper Mate, Waterman, Parker, Prismacolor, Expo, Accent, Liquid Paper. As one of Newell Rubbermaid's largest divisions offering more than 3,000 products, Sanford is an undisputed leader in the writing instrument and art industry. Sharpie: The #1 permanent marker world-wide! Sharpie Marker's tough, resilient tip produces a quick ink flow that dries fast, resists water and stays permanently on most surfaces. Paper Mate: Paper Mate products combine innovative technology with advanced ergonomic design for a smooth, comfortable, flawless writing experience. Expo: Write it on, wipe it off. EXPO dry erase products are America's #1 choice. uni-ball: Uni-ball Roller was the first metal point roller pen and is as smooth and responsive as a high quality fountain pen without the mess. Rolodex: Rolodex is the organizational authority when it comes to innovative, easy-to-use products for the home, office and in transit. At ReStockIt.com, we carry Sanford brands and products sold in bulk and individually at the lowest prices – guaranteed!